Hagiwara Mai has never really been my favourite, however, I liked her a little more than other people have in the past. Though she may look a little salty in contrast to the other members, and her vocals ridiculed (at least in the Western fandom), I have liked Mai, on more than one occasion. In the past, I thought she was adorable and sweet. Right now, I think that she is a growing young woman, one who is trying her hardest to show that she isn't the little girl we once knew her has. She mas matured since the early days of ℃-ute, and though she doesn't always look as womanly or even as charming as the other members, there is something about Mai that is likeable. She has her own brand of loveliness, and regardless of how popular she is (or, not), I think that she brings something to the group, and makes it the ℃-ute that we know and love today! Without Hagiwara Mai, ℃-ute would not be the fun, diverse group that it is. Much like all the other members, Mai is a wonderful addition, and the other four members would not be complete without her. In the early days of my fandom, I liked Mai a lot more than I do now. I thought that she was a really cute, fun girl who was definitely the aple of the fans' eye. She had a very innocent, adorable charm about her, but as she got older, Mai went from adorable, bouncy and small, to a confident, pouty young woman with a very serious expression. It was around this time that I started to lose interest in her, because for me, it felt like a switch that was very sudden, and very over-mature for someone who was Mai's age. Much like MM's mature look doesn't suit them now or in the past with the current lineup, it didn't really suit Mai-chan, back then. Luckily, after a few more years, Mai was able to pull it off flawlessly. She started to understand what she needed to do, and learned how to command attention in a new, far more entertaining way. In fact, her salty look was what caught me off-guard and made me realise how much she had matured; a kid who had once played up to the fans, and was innocent and cute, had become a little more surly and a lot less giving to the fans' wants. It was something none of the other members had, in ℃-ute, or even H!P in a way, so for a while, it was unique to MaiMai. She was being salty and serious, and I really did love it. In music videos, it actually worked well for Mai; she stood out against the other members and their bright, energetic smiles. She found a character, and though it can put some people off, this serious, almost quiet aspect of Mai worked on me, and I found myself enjoying the salty attitude. Aside from salt and vinegar being her main brand of flavour, I liked Mai's dedicated to the group, as well. Like everyone else, she has worked just as hard all these years to keep the group afloat, and to show everyone what she is made of. Though her popularity has probably taken a dip in recent years, and her front-member position depleting since her cute shtick went south, Mai-chan stuck to her guns and stayed true to herself as a member. Sure, she may not seem like she is the most energetic at times, but I honestly think that Mai loves and adores the group, and puts her 110% into what she does daily. If she didn't love it, I doubt she would be there, after so long. Ever since she was a child - she came into this gig aged 6, after all - Hagiwara Mai has been hard at work, pleasing fans and spending all her days performing, practising, selling singles and supporting her fellow team members, so that they can get recognised and continue as a unit. This girl has been doing this line of work for so long, and has missed out on her childhood as a result, but never once has she stepped out and said she can't do it. I respect Mai for this, and I think that it's an amazing thing that, so long ago as a child, she took a chance and made a decision to pursue the career of an Idol. She sacrificed so much, but has learned a lot and experienced many things. Hagiwara Mai is a wonderful girl, one with goals and aspirations in life. She did what she wanted from a young age, pursued it up until now, and has never once given up or complained of her struggles to the public. It's hard to think of what to say, honestly, because MaiMai is the one member I have had the least interest in. With Maimi, I at least had a change of heart overtime, but with Mai, it's a little difficult. She has always fluctuated in being interesting for me, and falling under the radar. That said, way back when, she was one of the members who began my vague interest of ℃-ute in the early days of Idoldom. Because I was a huge fan of Kirarin Revolution at the time of my conversion to Jpop and Idols, I heard of Kira*Pika, and became a fan of the short-lived unit that Mai was a part of with Kusumi Koharu. I found both cute and charming, and so I started to look up who each member was. Mai-chan, of course, happened to be a part of ℃-ute, too. So, in a way, MaiMai helped me to find ℃-ute, or at least, gauge a small interest in them at the start of my fandom. Where Airi helped me come to H!P and ℃-ute fully, Mai gave me a spark. She was a cute, adorable little girl, despite her head being far too big for her body at one point. I thought she was endearing enough, but, over time, that interest waned. I still liked her enough, but not so much that I could ever consider her a core favourite of my beloved H!P Idols. Thankfully, I can never say I have despised this girl. I've always thought that, despite her weaker singing skill, Mai has something about her that is to be cherished. I understand that, for some, singing is the be all and end all, but Idols aren't perfect; we want them to be, but they aren't, and what Mai lacks in singing, she makes up for in other aspects. From what I have heard, Mai is actually a caring, sweet member with a bright personality (despite the salt), and the fans who do adore her, know that she is more than just her singing skills. Hagiwara Mai makes people happy, and even though she is disliked for her vocals quite a lot by the Western fandom, I am so glad that she has many dedicated fans to show that it isn't all hate and gloom when it comes to MaiMai. Mai has really grown up since I first came into this fandom, and though I was unsure of the change at first, I can't deny that she has blossomed into a beautiful, serious young woman. Though Mai is stepping out of spotlight, I am glad that she knows what she wants, and is pursuing something that quite a few Idols are doing, now. Once she graduates, of all the members, Mai will be the only one to bow out of the limelight and step off the stage completely. In order to pursue her desired studies abroad, Mai will no longer be an Idol in this vibrant, entertaining world of singing and dancing, and will instead begin learning English away from her own country. It's something I didn't expect from her, but, I know that she is a serious, dedicated individual, so I don't doubt that MaiMai can do it. She;s run head-on for the Idol dream since she was six years old, and now, aged 21, Mai is going forward and chasing another dream, one that does not include a stage or costumes and dazzling lights. She will become a normal girl, live a life abroad, and join other Hello! Project Idols in pursuing the language of English, and staying out of the spotlight. This is what she wants to do, and I respect her decision, and hope that she creates many beautiful memories as she walks down a new path, far away from her fellow members of ℃-ute and her comrades in Hello! Project. It will be sad to say goodbye, but even if we don't have her smile on-screen or waiting for us in pictures, we will always have our memories of MaiMai and the happiness she brought to all her fans in Hello! Project. Hagiwara Mai is not my favourite member, but she is a member I will miss with all my heart. From the days where I knew her as a child, to the days where I see her standing proudly as an adult, I can see that this girl has blossomed into a mature, hard-working young lady with big ideas and big aspirations for what she wants to do in her future. I can only wish her the best in her endeavours, and hope that she achieves every goal she has set out to do. This girl is wonderful, despite what people say about her or her voice, and she has helped ℃-ute to become what it is now, and what it always will be once they graduation. Without her, we wouldn't have such a diverse, energetic and seasoned unit, and we wouldn't have her charm or salt that perfectly balanced out the group when she mastered the art of pouting. 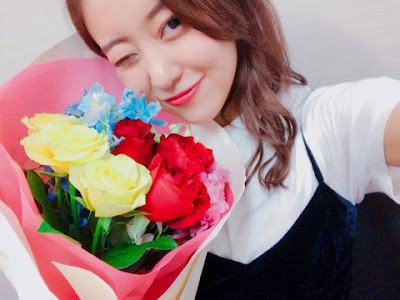 Mai has become so confident, and though she may not seem as vibrant or happy as the other members in some of the groups releases, I think that deep down, she is an excitable, happy young woman, who is full of gratitude for her fans and the people around her, who have made her life what it is. Even when she goes behind the scenes, even if we don't see her again, Mai will always be remembered, and she will always be loved. For so long, this girl has been adored, and for so long, she has given us her life, her smile, and her dedication. Now, it is time for her to put 110% into something else, and create a path separate from this one, a path that we can watch her walk down. Hagiwara Mai, これらすべての年をありがとう！We will never forget these Idol days, and your fans will forever cherish you! For 15 years and beyond, you have given us everything! We couldn't ask for more, and I am so thankful that you have brought happiness to many peoples lives, and brightened even the rainiest of days. Thank you for being an inspiration, and for being our Idol.